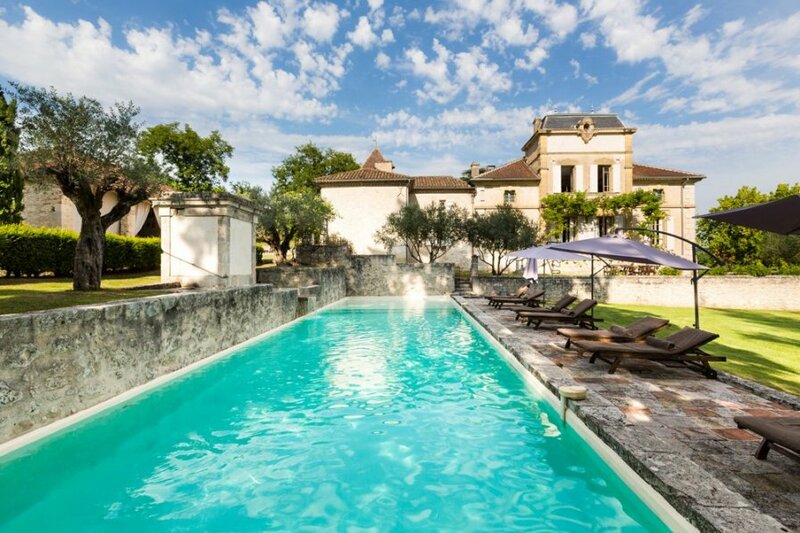 Chateau Ferme is an authentic tobacco farm situated on the borders of Tarn et Garonne and Lot et Garonne, a region sometimes known as the Tuscany of France. Chateau Ferme is an authentic tobacco farm situated on the borders of Tarn et Garonne and Lot et Garonne, a region sometimes known as the Tuscany of France. This beautiful estate is set in a sweeping landscape, where the laughter of large groups of melon pickers or the soft drone of tractors can be heard from the fields in the distance. Today, the chateau is a working sunflower farm that has 13 luxurious rooms all with en suite bathrooms, making it ideal for a stay with family, friends or other groups. In spite of the many luxurious touches, the chateau remains a throwback to centuries past, even if it has been thoroughly redecorated. Chateau Ferme has a wonderful stone swimming pool, beautiful sunny and shady spots, a large communal kitchen for cooking, long tables for dining in the evenings, a cinema where you can watch a film after sunset and a pool room where you can play a last game of pool before turning in for the night. And if you feel like an outing, there is lots to see in the surrounding area, with plenty of nature, medieval villages on hilltops and local markets. **Please note that for smaller groups of up to 16 a 20% discount has been applied to the website prices. The property has room for 21 guests in the main house and 6 more in the adjoining pigeoniere. There are also 2 movable baby beds. On the ground floor of the main house is the kitchen with utility room, a separate room for the pizza oven, a pool room and the salon. Opening onto the large central hall are three bedrooms with en suite bathrooms. The bedroom that adjoins the tower has its loo and separate bathroom with free-standing bath within the tower. The bedrooms on the ground floor have high ceilings, wooden panelling, wooden floors and fireplaces, and are decorated in different styles. A fourth room adjoining the veranda has a more rustic look with partly exposed stone walls, a fireplace, an antique three-quarter bed and a smaller bathroom. The communal rooms are grouped around the large kitchen on the ground floor. The kitchen has a large stone work surface which extends into the utility room. The utility room is equipped with two dishwashers, an espresso machine, an ice-cream maker and a blender. This has preserved the original feel of the kitchen by minimising “white goods” (standard kitchen appliances). The large fireplace with its original wood oven and a professional restaurant range make cooking for and with large groups a delight. There is a restored antique red Berkel slicer for slicing hams and sausages, and the long dining table on the veranda immediately outside the kitchen is big enough for the entire group. The kitchen itself has two fridges and there is a large American fridge with ice-cube maker on the veranda (out of sight but within reach), which is particularly handy for bottles and deep-frozen items. Adjacent to the kitchen is the pool room with panelling and painted frescoes all around, an open fire and, of course, the pool table. The salon has Venetian parquet flooring and a fine black marble fireplace. The velvet sofas, the gold of the wallpaper, the paintings and the large chandelier breathe the atmosphere of yesteryear. Fortunately, the flat screen TV and DVD player do little to detract from the ambience. The pigeoniere or dovecote that looks onto the courtyard is one of the finest examples in the area. It has been converted into apartments for 6 people over 3 floors. It is particularly suitable for one or two families with children staying with a larger party at the maison. There are two bedrooms for adults and a junior bedroom for two children. The salon has an extra sofa bed. The apartment has a somewhat more rustic, simpler interior than the main house, with stone walls and large wooden rafters, wooden roofing and terracotta floor tiles. It has a large stone fireplace and double doors opening out onto a private terrace with unobstructed views. The apartment's furnishings include children's beds, a playpen and children's chairs. The kitchen consists of a large central space and the bathroom has a bath with a shower. The courtyard is flanked by the barns and stables on one side and the maison de maitre and pigeoniere on the other. One of the two access gates is here, adjacent to the orchard. The orchard itself may be reached through a smaller gate. In the courtyard there is a fountain from which spring water constantly flows. The previous resident attributed his advanced age to the fact that he exclusively drank this water. The fine yellow gravel is suitable for petanque, particularly near the front door where the ground is most level. There are two professional stables, but in the summer you will see the thoroughbred Arabians on the sloping meadows in front of the chateau. This region is famous for producing Arabian endurance racehorses. We allow local trainers to use its meadows and stables, and have even housed the French champion. The largest barn is positively cavernous, and you might imagine that the last of the hay had just been carted off. The stage is perfect for informal presentations or performances. There are on Gas and one portable coal BBQ.The barn nearest the swimming pool (20x5m) has one open side and is equipped with art nouveau cinema seats and a large screen. At sundown, simply select the film (blue ray quality) and when you want to watch it: the gardener (caretaker) will take care of the rest. The total garden area is more than 2 hectares in total. The local area is ideal for walking, exploring fine medieval villages, antique markets, horse-riding tours, playing golf and more. There are wonderful villages in the neighbourhood. Castelsagrat (2 km) is the closest village to get bread, a newspaper and a cup of coffee. A nice place to have lunch is under the medieval open marketplace in Saint Maurin where the owners are friendly and the lunch menu of the day is simple but good. St Maurin is 4 km in the other direction and you will pass Montjoi village on the way which is walking distance from the house. Roquecor and Lauzerte are larger villages that have the same charm but are busier with nice restaurants, cafes, boutiques and shops. The most exquisite place for lunch and dinner and a wonderful experience is the three star restaurant of Michel Trama. It's an absolute must but expensive. His restaurant “Aubergade” is internationally renowned and a 10 minute drive at Puymirol. It has been redecorated by famous interior designer Garcia. Don't be surprised to find celebrities dining here. Lunch and the house wine are great and reasonably priced. There are daily markets and schedules are announced in the local newspaper. Local farmers sell their produce here. Don't miss the spring-only strawberry variety “Gariguettes” filling the stands or the bundles of green asparagus. Look out for announcements for antique markets (Brocantes or vide-greniers) on the roadside at roundabouts or intersections. Moissac (15 km) has a beautiful church and an impressive monastery visited by pilgrims on their way to Santiago de Compostella. Next to the monastery is the Bistro de l‘abbaye on the church square where lunch outside is wonderful in the shade of the magnolia trees. Toulouse is a one hour drive over a comfortable highway. It's a beautiful city and perfect for shopaholics. Its easy to reach with the train from Agen. Cahors is a ¾ hour drive and an option for visiting wine estates. A hot tourist attraction is St Emilion: the authentic wine town next to Bordeaux with wine history at every corner. Bordeaux is a stunning city at 1½ hours. There is a water-amusement park at Agen (20 km). For small children you should check out the clear clean water of the Seoune at the waterfall at “Rikiki plage”. This is a few kilometres on the D60 to the east. It has a small sandy beach between the trees, a meadow and a waterside tree with a rope tied to it. Mostly you will be the only ones there but sometimes another family will put their picnic baskets on the meadow too. There are several horse-back riding facilities in the neighbourhood and there is a small child-friendly one on the way to Roquecor. There is a little restaurant too where the lady of the house makes a perfect steak on the hearth for lunch or dinner.